The Diva challenged us to a duo tangle. JUST 2 tangles, Molygon and Marasu. For links to the individual tangle stepouts and to see what others have done with this challenge, follow this link. First I drew Molygon in an organic spiral with my black micron on a renaissance Zendala. I started with the small "orange slices" in the center getting larger as they spiraled out organically. At first I tried not to let them touch, but midway, that just wasn't working, so I let them stack on top of each other in Hollibaugh fashion. Adding some color: Because I envisioned drawing a spiraling Marasu over Molygon, I thought some color added between The Molygon slices would help me to differentiate between the 2 tangles. Turns out, this step helped tremendously later. I used a Tombow marker and my waterbrush so I could feather out the color for a subtle blend. I scribbled color on my laminated cardstock. (You could use a blending palette, craft mat, a piece of plastic or acetate.) And picked it up with the waterbrush. Laying it down with less water in the center, more water toward the edge of the tile. The next step is patience. You MUST let the tile dry before moving forward. I let mine sit for a couple hours, although you could dry it with a hair dryer or craft heat gun. The next step was was a little scary. 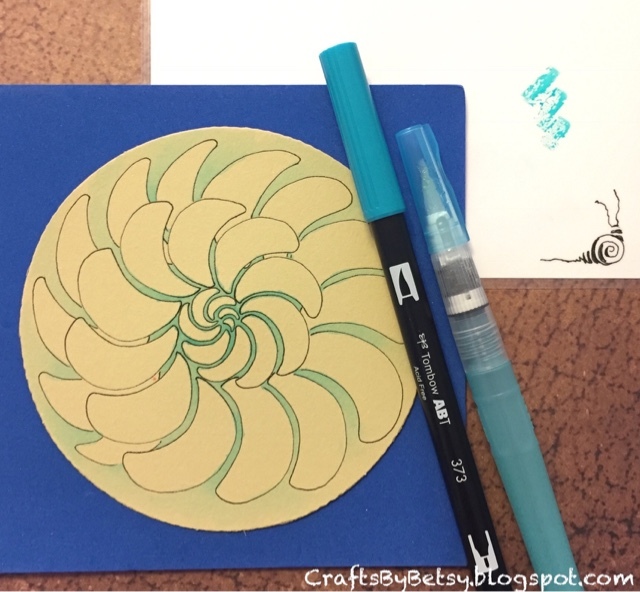 I took my brown micron and drew a spiral over the Molygon. Just totally ignoring the Molygon. I thought about using a pencil string, but in the end I just went for it with my micron. 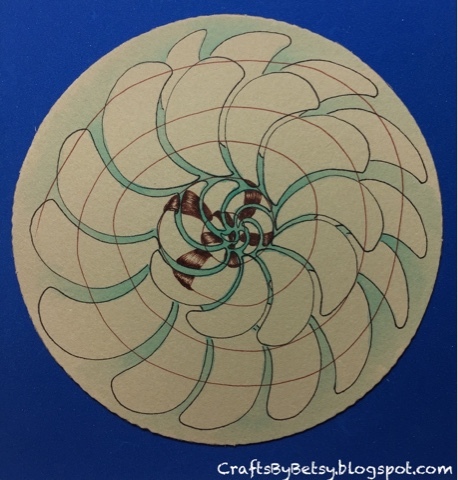 Then I used that brown micron to draw in the larger stripes of Marasu by wrapping the stripes around my spiral lines, working outward from the center. I only drew on the Mollygon slices. I skipped over any of the blue green. I think this might have gotten confusing quickly if I didn't have that color wash down. With it, it was easy to skip over the blue green areas. Next I added narrower black lines. It was easier this time to work from the outer edge toward the center. I wasn't quite sure how to end the stripes, and thought I might return to the outer edge later, but in the end, I liked it that way. 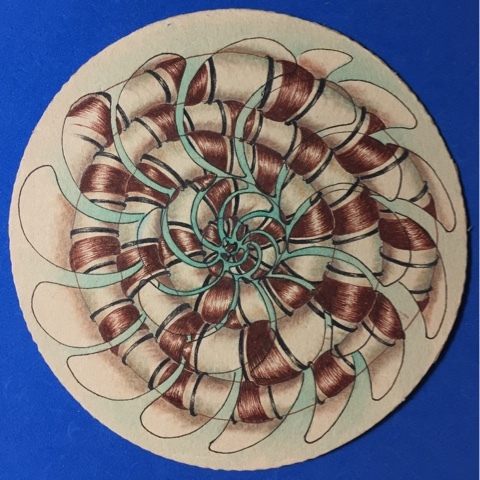 More color: Next I added shading by adding the darker brown Polychromos color to the lower edge of the brown spiral line, again trying to only add it to the Molygon and skipping over the blue. I blended this color with a blending stump and odorless paint thinner. 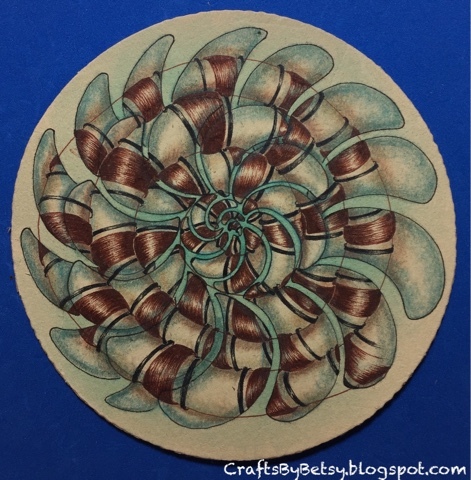 I added a lighter brown on the other side of the spiral line. Then Molygon was pretty hard to see so I added the blue greens around the edges of Molygon and blended. The Renaissance tiles look fabulous with white. One problem I have with the Generals white charcoal is that I can't really add layers on top of it. Because I thought I might need some more layers, I used my white Prismacolor. 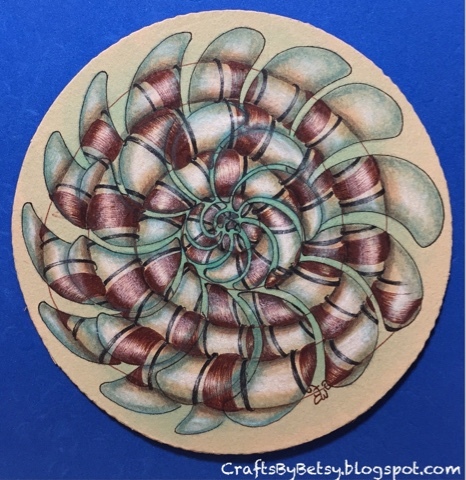 I'm a fan of the Polychromos, except I must admit that I like the white in Prismacolor as it shows up better. So my next step is adding white in the spiral of Marasu. I used a dry tortillion to blend it somewhat. I felt the Marasu needed to pop more, so I added black to the spiral edge. I liked that, but felt it needed more, so I added the gray Fabrico Marker too. During all of these steps, you're just focusing on one step, not the overall picture. When I took the time to take it all in, it was so cool to get lost in the 3D effect spiraling in and out. One last note, I try to indicate my inspirations whenever I recognize them. Sometimes it's hard to remember just where I saw something, or to notice that I've been influenced by ....(colors, moods, people, TV, YouTube, magazines, etc etc). There is so much that affects me at least subconsciously. This time, I knew my overlaying the tangles wasn't an idea I came up with, just an idea I wanted to try. I thought it was Margaret Bremner who had inspired me, quite a while ago. 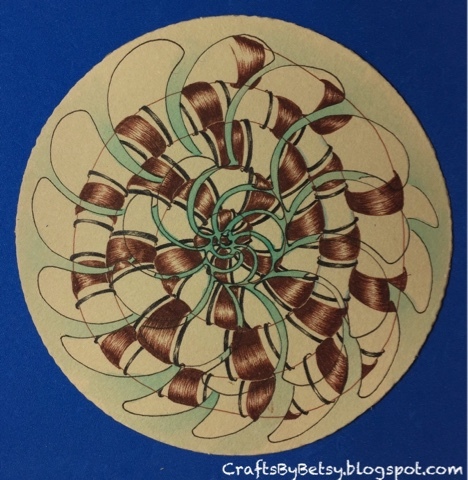 I looked back through her blog, and sure enough there it was...here's her post on overlaying tangles. Ohmigosh! This is absolutely stunning. Thank you so much for sharing your process and Margaret's link. All I can say is that your artwork is amazing and thank you for the steps that you used in creating this stunning masterpiece. Absolutely beautiful! Wow! Thanks for showing us the process. 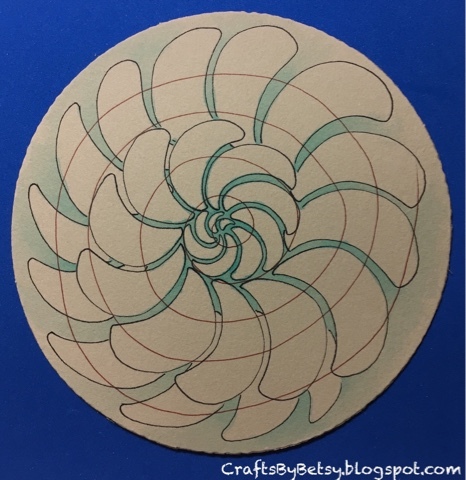 I really loved how you drew Molygon in a spiral on the 1st tile, but then Wowsers, it kept getting better and better with each tile! Incredible process and the end tile is stunning! Thanks for sharing! 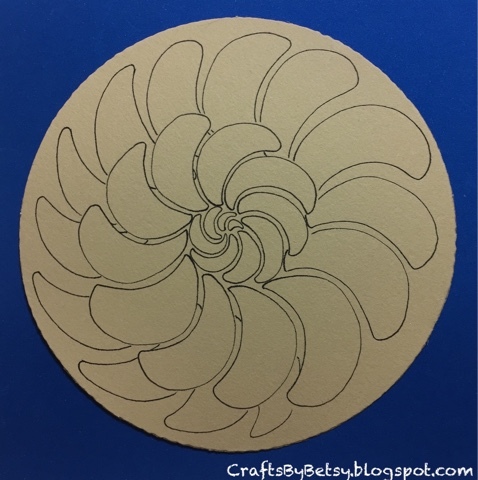 Thank you very much for sharing the process of creating this stunning, intricate piece of art! The result is absolutely gorgeous! Betsy, this is fabulous! Thank you for sharing your process with us. 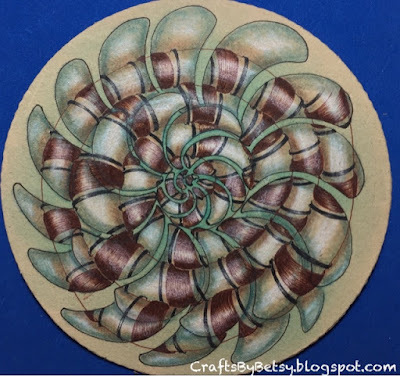 I will check out the 30 day color challenge and Margaret's link. Thanks for sharing the process! Your Zendala is gorgeous! Beautiful Beautiful tile and thank you so much for sharing all your steps. It was fantastic to see the process, of this gem of a tile! This is amazing! 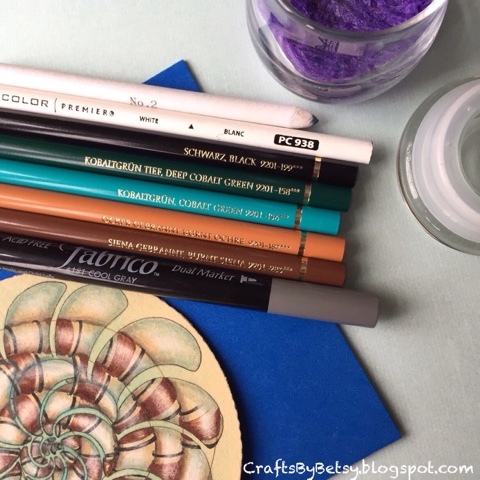 Love the step by step photographs of your creative process! Fabulous work! 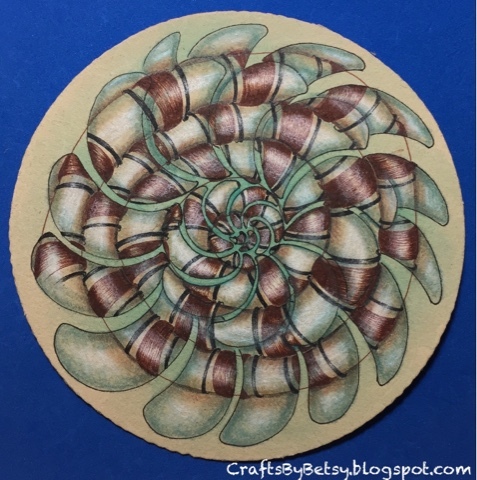 Thank you for participating in the 7th - 30 day coloring challenge!